Home Mattress Basics What Is Inside A Mattress? The Sleep Specialists at the Mattress World Northwest in Portland, OR often advise customers that it’s not so much the brand name or the price that dictates “the best mattress” – but, rather, the mattress materials and what’s inside. We’re looking to identify the shopper’s individual definition of “comfort” and narrow down the search to a manageable set of options. Our floor models come with a wide variety of mattress stuffing and support structures that affect the firmness, motion isolation, noise reduction, temperature and durability of the product over time. To answer the common question “What is a mattress made of?” we’ll explain the various types of mattress on the market today and cover the different factors that set different models apart. Get Your Free Sleep Analysis Now! What are innerspring mattresses made of? The “traditional” mattress is designed with steel coils. In the past, these coils were all interconnected in one long continuous coil, but most of the models built today use individually-wrapped coils to reduce noise and motion transfer, as well as strengthen the overall system. The coils of inner spring mattresses range in gauge thickness (from 12 to 18) and in count (from 500 to over 2,000), which factors into the price. There are also different materials used to encase the coils, including: canvas, cotton, organic cotton, or wool, among other textiles. Shoppers like these mattresses because they are very affordable, they range greatly from ultra-firm to super-plush, and they allow good air-flow for a cooler night’s rest. What are memory foam mattresses made of? Memory foam is made from polyurethane foam – a material first manufactured in the fifties by mixing water with halocarbons or hydrocarbons. Depending on the chemicals added, the mixture could be processed into everything from car parts, to spray liner, to sleep surfaces. Today, memory foam mattresses are usually made from polyol mixed with water and a chemical compound called a diisocyanate. You can imagine the solution rising like bread, with the cell structure opening based on the application of chemicals to allow more or less airflow, creating more or less spring. These mattresses vary by firmness (from 1 to 14 pound Indentation Force Reflection), density (from three to eight pounds per cubic foot) and thickness (from 1 to 13 inches). Consumers choose memory foam for the supreme comfort of the mattress stuffing and the way it “hugs” the body to reduce pressure points. What are latex mattresses made of? Natural latex mattresses are made from natural rubber derived from the Radium Natural Talalay or Hevea-Brasiliensis tree’s milk. Synthetic or blended latex mattresses are made from a blend of natural rubber mixed with butadiene or styrene, byproducts of petroleum refining commonly used in industrial manufacturing. Latex mattresses vary in material construction – with 100% natural organic latex mattresses costing more than the synthetic blends. They also vary in firmness (measured in the Indentation Load Deflection standard from 4-8) and thickness (from 3 to 20 inches). There is much versatility in these mattresses, with the ability to add or subtract custom layers of individual zones within the bed for a truly personalized sleep experience. Much like memory foam, fans of latex love the “hug” of a latex mattress that conforms to their bodies and relieves all aches and pains. They also like that the layers can be customized for two different sleepers within the same bed. The natural latex appeals to eco-conscious consumers looking for the healthiest sleep surface. What are hybrid mattresses made of? 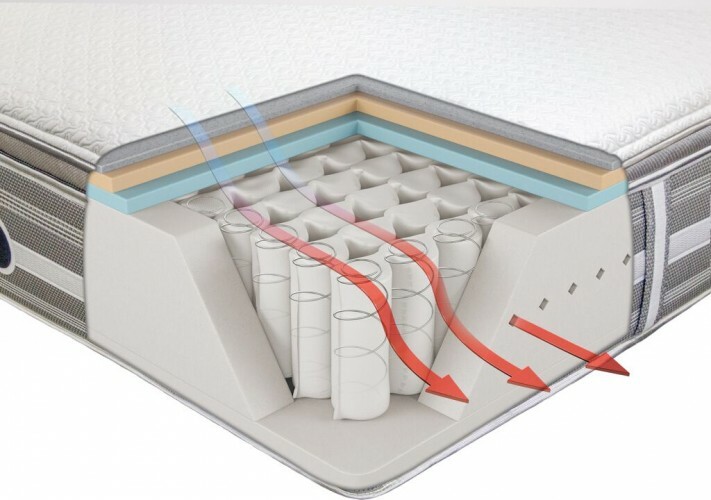 You’ll find that many mattresses today come with conventional innerspring support structures, combined with topping layers of memory foam or latex for added comfort. Hybrid mattresses vary in thickness (from 1-2 inches of foam and up to 17 inches total thickness). Firmness levels run the gamut from firm to plush. As with any innerspring mattress, the coil type, thickness and gauge vary as well. Hybrids provide excellent relief from back pain and somewhat conform to the body, but the sleeper feels as though he or she is still sleeping “on top” of the bed, rather than “in” it – which some people prefer. Motion isolation, noise levels and maintenance are low for this type of mattress. What mattress filling is right for you? If you live in the Portland, OR area, stop by one of our 11 mattress store locations to speak with our Sleep Specialists about mattress materials. Let us know if you have concerns about allergies, chemicals or environmental processes used in the manufacturing of your bed. Tell us about experiences you’ve had with past beds, any medical conditions you suffer from, and which position you typically sleep in – be it side, stomach or back. At Mattress World Northwest, we guarantee that with our large selection and helpful staff, you’ll find the most comfortable mattress stuffing and support, customized to suit your needs!